I figured out this one by accident. I was trying to do something completely different and came up with this it. 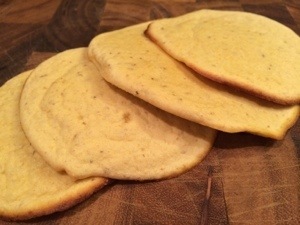 I live normal corn tortillas but since I try to paleo they are not an option. Plus this version held up better then a corn tortilla, more flexible and easier to work with. Place everything in a food processor and blend into a pure. Place one TBS rounds on a foiled cookie sheet far apart because they will spread. Bake at 375 degrees for about 15 minutes. Once edges become golden brown your done. 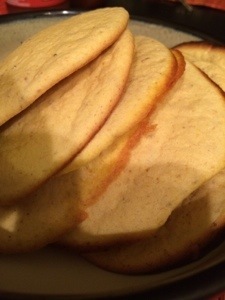 Remove from over, allow to cool and serve with any filling. puree, not pure; tbs, not TBS, oven, not over; you’re done, not your.